The idea of a crank handle, specifically to wind in cord and operate a crane hook, was one of Frank Hornby's 'visions' for all Meccano outfits, and was a feature of every single outfit made (except for the tiny 000 outfit of 1930-35, and the 70's 'Pocket Meccano' outfit). Many complaints were made about the difficulty of firmly attaching a piece of cord to a crank handle, and for a time cranks were made with tiny holes to thread the cord through. The real solution had to wait until 1931, when the 'anchoring spring for cord', part 176, was finally made, although even that wasn't included in outfits until 1934. There is a confusing range of numbering for the cranks. Initially, there was only one grooved crank, which had no number. Part number 19 was added in 1905 but had varying lengths. Various lengths were supplied with holes about 1½'' from the end, through which one could tie off the cord. This idea was eventually dropped, and the length settled on 5''. In around 1927, this part was joined by a new shorter crank of 3½'', named 19s (for 'short'). In 1937, with the introduction of the numbered outfits 0-10, a new short 3½'' crank with a grip was added, part 19g (for 'grip'). The 19s remained in production without the grip, for the smallest outfits 00,0, and 1. Part 19 was dropped altogether, but a new 5½'' crank handle with a grip became new part number 19h. We will have to assume that the 'h' is merely the next letter in the alphabet after 19g, unless someone knows better. So we have two short cranks, 19(s)hort and 19(g)rip, and the long one with grip 19h. Although the grips were very useful, costcutting in 1965 led to the outfits losing all the crank handles with grips. Part 19g was dropped altogether and 19s was substituted in the larger outfits. Part 19h lost its grip, but kept its number because it was the only long crank handle in the system at that time. The picture shows the contents of the largest outfit for the key dates. In the 30's (the outfit 7 and later outfit L), three long and one short crank were supplied. No crank handles had grips at this time. Immediately post-war, a 10-outfit had three crank handles (one long and two short), with nice brass grips. By 1960 (in the light red/green era) red plastic grips had replaced the brass. 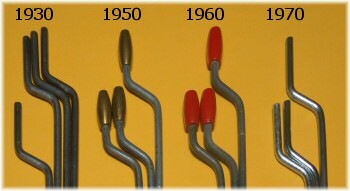 By 1970, all grips had gone from both lengths. 1920's crank handles are often stamped "Meccano Fabrique en Angleterre" (MFEA), and the early rounded-end ones with "Meccano". The 19g.re example shown in the table below has "Meccano" stamped in the late-30's style font next to the Erinoid grip. The ones in the photo to the left have MFEA (left) and two different "Meccano" stampings. I am slightly confused, as out of my stock of the longer cranks(age varying over a wide period e.g. plain/ brass/ erinoid/plastic grips)NONe of them are 5.5" measured on the straight part of the shaft. Shouldn't the table headers be corrected to 5" ? I have a 1950's Dealers parts display, and the 19h is described as 5" on there. Nope - the crank is plain, same as the axle rods. It wouldn't be blackened, the crank is normally not a brassed or nickeled part, right? (Except some early nickel-period.) Was imagining that somebody at Meccano thought the bright-red grip a bit much for the otherwise sombre set so they substituted black for a while. RobertG, I would think it would be unlikely that the black plastic grip handles would be from the 1951-53 black period. If they had have been, I would think the whole crank would have been chemically blackened. Could the black plastic grip handles be '51 / '52 (Korea) period? Just got the remnants of a '51 Outfit 4 with black pulley, spanner and short black screwdriver all correct. It had the crank with a black plastic handle. The outfit looked otherwise unmodified - i.e. bits missing but nothing that should not have been there. Ergo; should the .bk also here be '51, made to match the other blackness? In a job lot I found a crank handle with a right hand bend. Picture available I now have 2. total length about 5.250 and the rod part about 4.500 I wondered is this a Meccano part. My Meccano sets (N°3, 3a, 7, 7a, 8a) were all bought in Venezuela in the early sixties (light red-green), and they only contained crank handles N° 19 and 19s, although in the instructions they were clearly shown with grip. Maybe "colonial" supply? Actually, all my sets contained at least one malformed/defect part (e.g. a N°24 disc wheel without thread, bended N°20 flanged wheel, bended N°62 cranks, bended rods, no 154b corner bracket and so on).